Mince pie is good. Don't forget to add a little brandy before you warm it up to serve it. That's a lovely idea! Happy Thanksgiving! You bet, friend. The brandy is ready and waiting. In fact, I'm soaking (I believe the technical term is macerating) the raisins in it right now! Woo-hoo! I just spoke to Wolfgang Puck on the phone! On Martha Stewart this morning they gave out a number you can call til 5:00 EST today to ask famous chefs questions about cooking Thanksgiving dinner. My roommate is brining a turkey, so I called to ask about brining timing. I hadn't realized it was a live Sirius radio broadcast, but I hung in there and asked my question. What fun! The number is 866-675-6675 if you want to try it out. Cool! I am brining a turkey too! What did he say? For a 21-pound turkey, overnight should be fine. We need to start it baking by 11:00 or 12:00 for a 5:00 meal. I'm guessing you don't have deep-fried turkey, either. That's something to be thankful for! Deep-fried turkey?? what in the world is that?? A turducken is a dish consisting of a de-boned chicken stuffed into a de-boned duck, which itself is stuffed into a de-boned turkey. 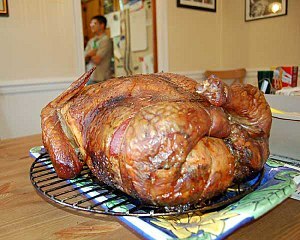 The word turducken is a portmanteau of turkey, duck, and chicken or hen. You American guys are so modest when it comes to food!!! Why stop at the turkey?? The turkey can be stuffed into a de-boned pig, and the pig can be stuffed into a be-boned sheep, and the sheep can be stuffed into a de-boned cow, and the cow can be stuffed into a de-boned moose, and the moose can be stuffed into a de-boned bear. And why not stuff the whole thing into a de-boned whale -- sea food is supposed to be good for you! You mean there's a risk it will come alive and attack him? ?